Happy Birthday William Shatner - he's changed the world! 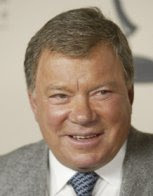 How to de-age Shatner for an appearance on Boston Legal? - Cheat! And: Police arresting actors in Hollywood for - shock-horror: making movies! We have first news on Mike Bay's next project, an air date for Painkiller Jane and an opinion on the sword and sandals action-movie 300. Also we answer a question which has plagued millions: What is Ken Kercheval doing now? Well wonder no more. And finally: An exclusive 2IGTV in-depth discussion and deconstruction of the Battlestar Galactica Season 3 finale. (We keep that until after everything else is done and give you plenty of warning so there's no danger of spoilage).